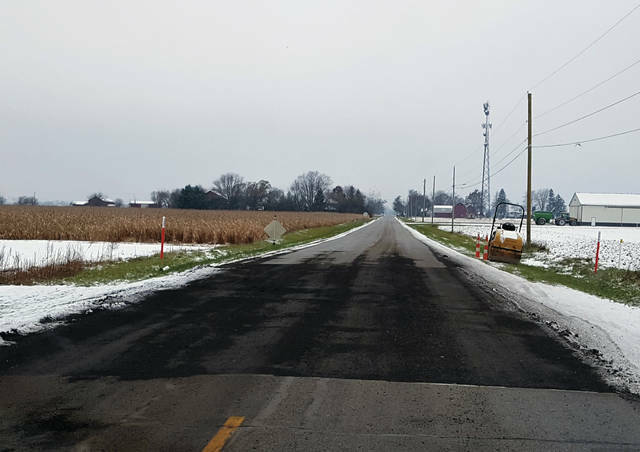 Repair of the damaged section of County Road H west of Swanton has begun. After two years of laying pipeline, NEXUS Gas Transmission has nearly completed the portion of the project involving Fulton County roads. Work in the company’s Spread 3, which includes Amboy, Fulton, and Swancreek townships, is nearly 100 percent finished, according to NEXUS spokesperson Adam Parker. Completed jobs includes tree cutting and clearing, welding, coating, trenching, and lowering in the pipeline. A Spread 3 status report for Oct. 27-Nov. 2 reported that county clean-up and road restoration are at 88 percent. That percentage includes restored waterbody and wetland crossings and roads on which lanes were closed. Fulton County Engineer Frank Onweller said the remaining work is essentially repaving and repairing affected county roads. NEXUS will focus on completing work on County Roads H, D, and 3, all considered high-volume roads, by year’s end. Seasonal weather will delay completion of the remainder. “There are some roads that are rough that will need to be repaired in the spring,” Onweller said. He said those roads are passable but in an unfinished condition that may worsen with icy conditions this winter. Generally, though, county officials are satisfied with NEXUS’s results, he said. He said NEXUS construction involving county roads is expected to be completed in the spring. He said he can’t speak for pipeline work NEXUS has done on private property in the county. The company has described ongoing work locally to include “environmental best management practices” maintenance activities; winter stabilization of soil determined too saturated for total restoration completion this year; and environmental and safety training. A partnership between Spectra Energy Partners of Houston, Texas, and DTE Energy of Detroit, Mich., the 255-mile natural gas pipeline begins in Ohio in Columbiana County. It travels northwest through the state, including the eastern part of Fulton County, and will connect with existing pipeline in Michigan. The 36-inch NEXUS pipeline ends at the Dawn Hub natural gas processing plant in Ontario, Canada. When fully operational, it is expected to deliver 1.5 billion cubic feet of natural gas per day.